Small Cottage Plans . . . Farmhouse Style! 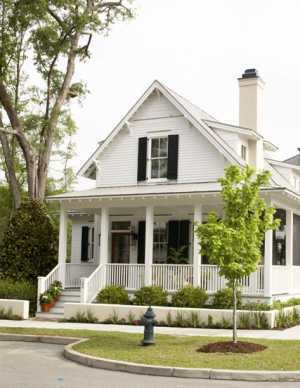 The small cottage plans featured here showcase a charming Southern cottage farmhouse with white clapboard siding, black shuttered windows, and a quintessential front porch that wraps around the side! 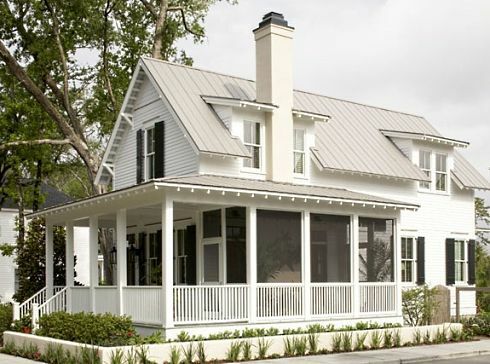 Created by Moser Design Group for Southern Living House Plans, SugarBerry Cottage simply oozes nostalgic charm and ambiance. With a front facing gable and a simple, but elegant, balustrade -- interrupted only by tall square posts designed to support the porch roof -- it evokes images of 19th century rural America. Actually, this small cottage plan boasts a total of THREE covered porches to expand its compact indoor living area of 1,687 square feet! Pictured at left with comfortable seating is the smallest porch, located at the rear of the cottage. 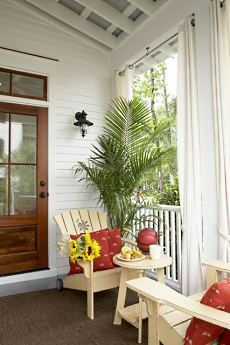 The image that follows shows the lovely and expansive front porch. Directly beneath it is a close-up image -- once again, complete with comfortable seating. The third porch is screened in and wraps around the side of the cottage as an extension of the front porch, as seen in the photo below. Pictured directly beneath it is an "interior" view of the screened porch. 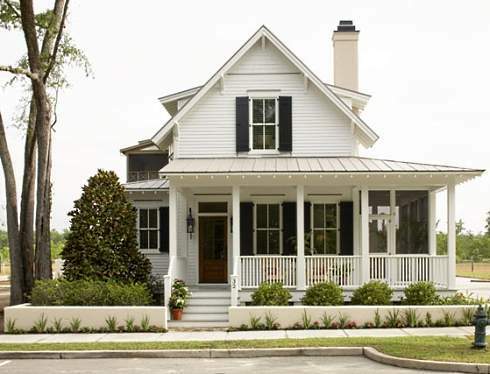 The cottage floor plans that follow show each of the two levels in this charming little farmhouse design. Pictured below is the main level, which encompasses 1,052 square feet of living area. It features a spacious living room with a large fireplace flanked by two sets of French doors that open onto the screened porch. A compact kitchen with a snack island opens into the living room. At the rear of Level 1 is the master bedroom suite. It features a walk-in closet and a bath with dual sinks. A half bath and laundry room complete the main level. The upper level encompasses 635 square feet and is occupied by two bedrooms -- each with double closets -- and a shared full bath. Shed roof dormers provide additional head room and flood the second level bedrooms with natural light. Though not part of the small cottage plans for this design, this particular example features a tiny garden cottage or shed, pictured below. A bracketed shelf, door and window overhangs add to the charm of this delightful little structure! 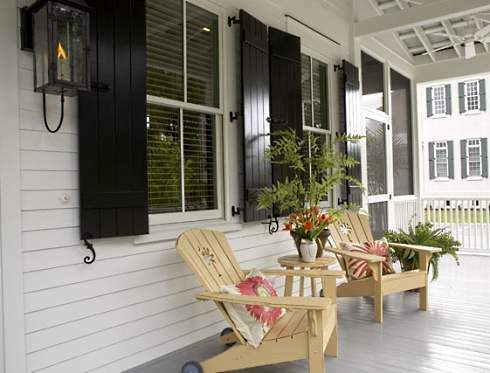 The interior of this Southern cottage farmhouse is as charming as the exterior, and loaded with nooks and crannies. Please click here for an interior view of this lovely little country cottage! Please check back often or subscribe to our RSS feed, as we frequently add plans for small cottages to our site. Compact Designs for Modern Living! Use this search feature to find it. Subscribe to our Free Newsletter for More Exciting Cabin & Cottage Design Ideas!